The Hysitron PI 88 SEM PicoIndenter is a comprehensive in-situ nanomechanical test instrument for SEM and FIB/SEM. The modular design also supports our full suite of testing techniques for future upgradability, now including 800°C heating, scratch testing, 5-axis sample positioning, electrical characterization, dynamic fatigue testing, and an interchangeable extended range (500 mN, 150 µm) transducer. Bruker Atomic Force Microscopes (AFM) and other nano technologies incorporate the very latest advances in AFM techniques, including the revolutionary PeakForce Tapping to ideally suit a wide array of application areas, from biology to semiconductors, from data storage devices to polymers, and from integrated optics to measurement of forces between particles and surfaces. Bruker 3D metrology and inspection systems include 3D Optical Microscopes and Stylus Profilers. 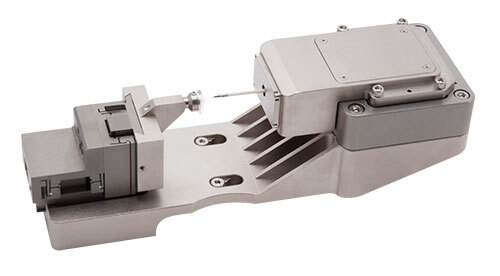 These deliver high speed automated measurements of critical dimensions, roughness, flatness and form. Applications include QA/QC on medical devices, tribology, film thickness, trench depths and optics form and finish. Our new production software enables fully automated one button operation. Instruments range from cost effective benchtop R&D systems to standalone high throughput production tools. Bruker Tribological Tools and Mechanical Testing tools incorporate innovative, leading-edge technologies — including proprietary multi-sensing technology with high-sample-rate data-acquisition hardware & software, highest-accuracy force sensors and amplifiers, high-frequency acoustic emission sensors and amplifiers, and more. Bruker Fluorescence Microscopy Products provide leading optical instrument designs and rich software features to researchers in neurobiology and cell biology for conducting uncaging experiments, optogenetics, simultaneous electrophysiology studies, as well as photoactivation, photostimulation and photoablation experiments.